See some angry birds fly right at your face. Awesome! Have you decided to skip the iPhone 5 and the latest Android tablet? We can understand why. Iterative products might seem like they are not worth the expense. But that's not true with every new gadget and piece of technology. The innovative new gear in this list offers something brand new and cutting edge that breaks the norm. As we move closer to the reality of living in the Star Wars universe (minus the TIE Fighters), it's inevitable we'll start seeing the gadgets and ideas from the movie. This mind-controlled orb, which looks like the one Luke could see with his mind on the Millennium Falcon, uses NeuroSky technology to read your concentration level using a headset with electroencephalography (EEG) sensors. The orb uses a helicopter that can freely move left, right, up and down based on where you direct it with your mind. Another innovation: the entire project uses an open-source mentality for tweakers and hackers. One of the main frustrations in vacuuming is that you have to deal with tangled strands - usually human or pet hair. This £45/US$69.99 (around AU$67) attachment for the Dyson DC19 vacuum cleaner uses counter-rotating brushes that remove hair before it tangles around the main brush. The attachment itself also has a wider contact area that maintains suction with the carpet for longer, even in tight crevices. Our first thought: what else can be tangle free? How about the lawnmower, weed trimmer or maybe the family dog? What do you do if you want to beef up your satellite internet service? For starters, you launch a new satellite with 140Gbps of bandwidth. That's enough to provide 12Mbps of access to subscribers. That's over 10 million Gigabytes of usage per month. The new bandwidth also creates a faster signal by using a wider spectrum called the Ka Band and by concentrating the power (called a multi-spot beam). It's a US innovation for now, so internet users elsewhere should cross their fingers or send begging letters to ViaSat or something. Wearable tech is now becoming more viable, thanks to cheaper electronics, mobile processors and innovative interfaces. 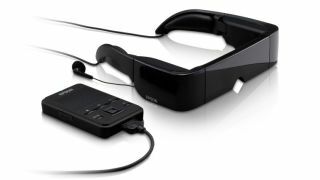 Like the Google Glass goggles, the Epson Moverio BT-100 is a see-through head-up display (HUD) that uses micro-projection technology. The display looks like an 80-inch LCD panel hovering in space. The transparent multimedia goggles display two images and can switch between 2D and 3D video. The computer, which runs on Android 2.2, includes a touchpad, lasts six hours, and has expandable storage. The futuristic angle is that if you can put up with the awkward looks, the entire computer is housed in the goggles, providing portability and convenience when you need a quick high-def Angry Birds fix. At £519/US699.99/AU$749 though, the Epson Moverio BT-100 isn't cheap. The most compelling feature for this Ultra HD/4K television is that it is actually shipping and available. Granted, at £25,000/US$25,000 (around AU$37,055), the price tag is a bit steep, but you get 3840 x 2160 pixels of glorious resolution on an 84-inch display on the Sony KD-84X9005 (called the XBR-84X900 in the US). The 60-degree viewing angle is also helpful for home theatre viewing. As almost an afterthought, the display also enables you to play 3D movies. For future-proofing your home entertainment, this is the display you want if you need to buy now - and have that kind of extra cash.